Ride on toys are a classic choice for kids, however, the ones that are powered by 24V and 36V batteries provide a new element of speed beyond the 12 and 6 volt or pedal options that young kids love. With so many different kinds of battery powered ride on toys available we know it can feel overwhelming when trying to find a toy that’s best for your child. So, in order to make the buying process super easy, we’ve carried out the research so that you don’t have to. Simply have a read through our shopping guide below to gain all the information you need on the top options available. We have provided information about the main features, upsides, downsides, recommended ages of each one and why 24 and 36 volt vehicles are great for kids for entertainment and physical development! A buyers guide section is also available at the end to provide you with a little extra guidance if you’re struggling in making a final buying decision. The Peg Perego Polaris comes with 2 different speed settings. The lower speed enables your child to drive up to a top speed of 3.5 mph whereas the higher speed lets them go to the top speed of 7 mph. There’s also a reverse function which can be useful if they get themselves into tight corners! We liked how the wheels have been designed to be incredibly strong and durable. It ensures that kids can ride around and have a blast for years to come. They can also ride around with a passenger on the back. With a maximum weight capacity of 150 lbs, this ride on toy can fully support two kids which can make the experience more fun. Kids have been loving how they can have a friend or sibling ride around with them on the back of this ride on toy. The wheels and weight capacity limit are able to support them for safety too. 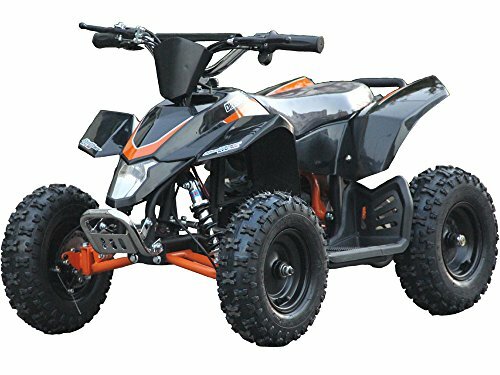 This Electric Sports Quad is able to handle a maximum weight limit of up to 160 lbs. It’s also recommended for kids who are between the ages of 4 and 8, therefore, this weight capacity feature is more than enough to support your child. It comes with 24 volts of battery power which is just enough for most 4 – 8 year olds but not too much. The toy takes around 6-8 hours to fully charged. When it’s at its full charge, kids are able to drive it around continuously for up to 2 hours before it needs recharging. Most people are happy with how long the battery lasts. There are some fantastic disc brakes that have been fitted to the quad toy which are reliable and provide your children with plenty of stopping power to keep them safe. To add to the safety features, the company has also implemented parental speed controls. This enables you to put a limit on the top speed that your child can drive by using a set of keys. Since the maximum speed is pretty high, at 10 mph, this is an excellent feature that keeps kids who are less experienced safer until they’ve built up their confidence. The real independent suspension system is fantastic at providing your kids with all the support and stability they need while riding. 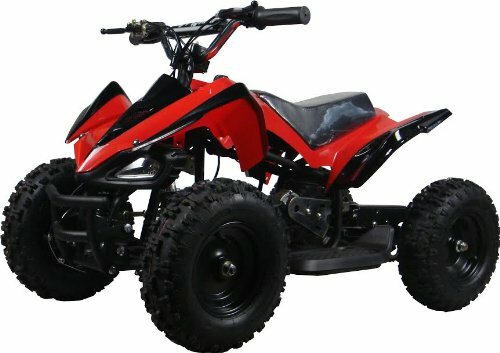 In addition to the rubber tires, kids can drive this ATV around smoothly for a fun experience. The real rubber tires, high-quality suspension, and 10 mph top speed provide kids with a lot to have fun with. Parents are also glad to discover that they can limit the speed depending on their child’s riding ability. This Peg Perego Camo Ride on comes with an awesome 4 wheel suspension feature and 24 volts of power. This makes it an excellent choice if your child is looking to do some off-roading. The 4-wheel drive provides them with plenty of control. The suspension system is effective at reducing the impact of any bumps along rougher terrain. Parents are given a peace of mind in knowing that they can put a limit on the speed of the ride on toy. There are 2 speed settings available. The lower one lets kids ride up to a top speed of 3.5 mph whereas the higher one enables them to go up to 7 mph. We were impressed with how they’ve included luggage racks. Kids love transporting all kinds of items as they drive around. Furthermore, there’s a flip-up feature at the rear which enables another person to sit on the back. As a result, children have a blast riding around on this ride on toy together. 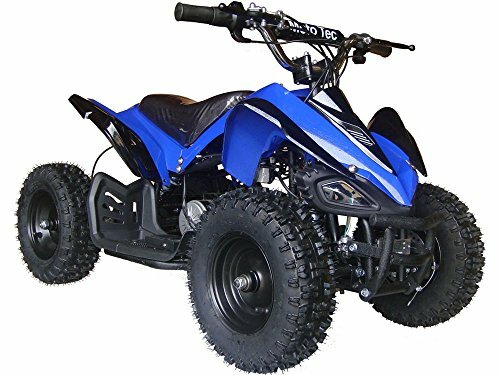 Due to the remarkable 4-wheel drive and suspension system, this ride on toy is a fantastic option for kids who want to play on off-road surfaces. 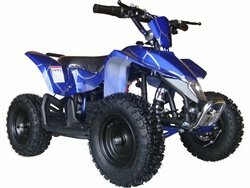 This Sports ATV is an awesome choice if your child is looking to do some off-roading. This is because it has been designed with 4 tires that are specially made for off-road conditions. It is powered by two 12 volt batteries making for a total power of 24V. In addition to this, they’ve included a complete suspension system. The combination of the off-road wheels and a solid suspension system provides kids with a stable and smooth ride on rough terrain. Moreover, the chassis they’ve included has been made using high-grade steel. This material is incredibly durable and strong to withstand any damage. They’ve fitted disc brakes to this which means you can feel reassured that your child is provided with reliable stopping power to ride safely. With a full charge (which takes around 6 hours), you’re able to get a total of 2 hours of continuous use. The ATV ride on toy can also travel up to an impressive speed of 10 mph. This is more than enough for most kids to have a ton of fun with. There are 2-speed settings, which include low and high. Putting on the low setting limits the toy to 5 mph, whereas the high setting lets you ride at the maximum 10 mph. We liked how they’ve designed the handlebar to have some padded material. This makes it softer and more comfortable for kids to ride. Moreover, there are footwells that have sturdy platforms for lots of support. If your child is riding in darker conditions, they can switch on the powerful LED headlights to light up their path. With off-road tires and full suspension system are what makes this such an impressive ride on toy for kids. They can take it across some bumpy terrain and have a smoother and more stable experience. This John Deere Gator by Peg Perego has 2 speeds available. The lower one puts a limit and lets kids drive up to 2.5 mph. You also have the option to select the higher setting which lets children ride up to the maximum speed of 5 mph. It has 24v of total power making it just right for little kids. A reverse feature has also been built-in to this ride on toy. This provides your child with more options in case they get stuck. They’ve created this ride on toy with a 4-wheel drive feature. Therefore, you can expect it to perform well on off-road surfaces. Not to mention, the wheels have been designed with a ton of traction for added stability. We liked how there’s a dump bed available which can hold up to a maximum capacity of 66 lbs. This is an awesome feature that kids love to play with to drive around various items. With high-traction tires and a 4-wheel drive design, this ride on toy is a lot of fun to use outdoors. It can climb up small inclines and kids love being able to lug around different items in the storage areas. 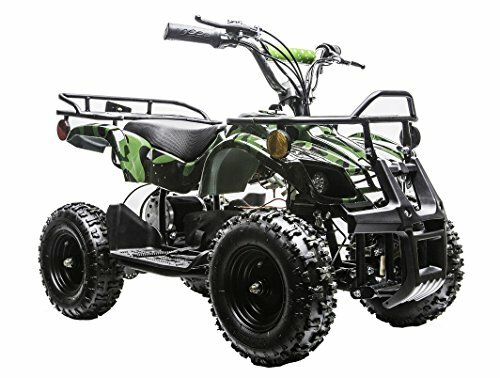 This 24 Volt Family Go Karts ATV is a fantastic option for younger kids who want to experience some off-roading but are still too young for 36 volts of power and speed. This is because it comes with off-road tires that have been specifically designed for better handling on uneven surfaces that you face when going off-road. In addition to this, there’s a full suspension mechanism which ensures your child is provided with a ton of stability and support. It also works effectively to keep the ride as smooth as possible for a better experience. You can get 2 hours of continuous runtime out of this ATV after it has been fully charged. The charging time takes approximately 6 hours. The electrically powered motor is able to take your child to a top speed of up to 10 mph. This maximum speed is more than enough for kids to have a blast off-roading with. There are 2-speed settings available. Choosing the low one keeps the quad at 5 mph whereas the high one enables your child to ride at the top speed. There are LED headlights available which make riding in darker environments safer too. With off-road tires and a full suspension system, kids are able to have an incredible time off-roading. Parents are also given a peace of mind by being able to put limits on the top speed. This Red Ranger Polaris is made by the well known Peg Perego and has been create with powerful wheels that have an awesome super traction Red Line feature. This makes the ride on toy incredibly effective when it comes to providing traction and stability when going across tricky terrain. In addition to this, they’ve included a rear suspension system. This works well to absorb any of the shock from off-roading to ensure your child has a smoother experience. There are 2 speed settings available that allow up to 24 volt of power. For beginners, you can choose the lower setting to limit the speed to 3.5 mph. However, if your child is a little more experienced, you can select the higher one and let them drive around to reach a top speed of 7 mph. The pedal for accelerating is super easy to use. We also liked how the brakes can kick in automatically to make it easier for kids to ride. The pedal for accelerating and automatic brakes are very easy to get the hang of for younger kids. The suspension and high-traction wheels also make for a smooth ride when going on off-road terrain. This Mini Quad ride on vehicle has a motor that is powered by a 24V battery. This provides your children with lots of power to drive around and have a blast with. It can reach a maximum speed of up to 10 mph. To ensure parents have the reassurance that their kids will be safe while driving this quad, they can control the speed. This is a result of the key that’s provided. You can only alter the top speed by using the key. Therefore, if your child is younger and doesn’t have much experience with riding these toys, you can set the top speed to 5 mph until they build up their confidence. Charging this Mini Quad takes anywhere between 4-6 hours. Once it reaches a full charge, your child can drive it around continuously for up to 2 hours before it needs to be charged again. It can also handle a maximum weight capacity of up to 150 lbs, which is plenty to support kids between 0 and 6 years old. 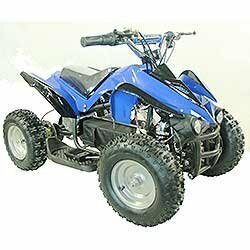 The blue design of this Mini Quad is bound to get your little boy excited to ride it. You can be sure to let them have a lot of fun, while also keeping them safe by using the speed control key if necessary. The X V3 Quad is a fantastic option with a total voltage of 24. 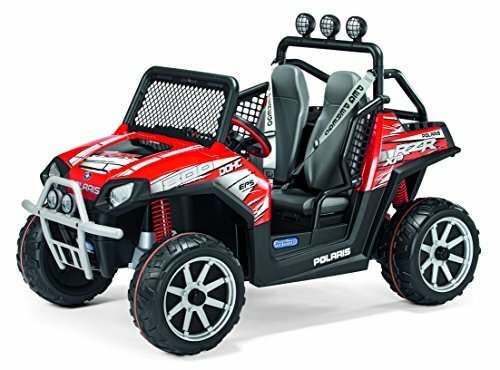 It’s great if you’re looking for something that the kids can take outdoors and have a blast with but not as powerful as the 36 volt vehicles that are quicker. It’s perfect for being used in the backyard, driveway, or even dirt trails. It’s able to go across rougher surfaces while still feeling smooth and keeping your child fully in control. This is largely a result of the complete suspension system. The suspension is available at both the front and back of the quad which ensures your child is provided with a lot of support for smooth riding. 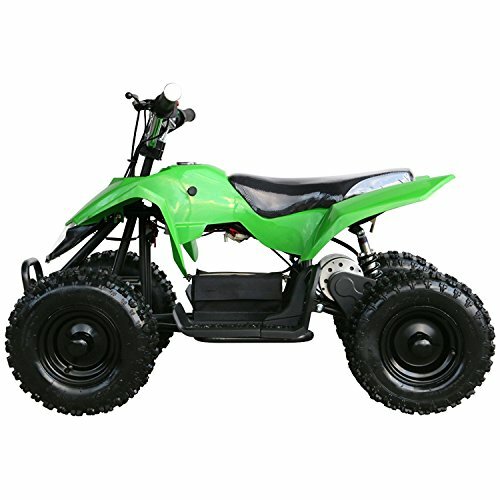 The large pneumatic tires available are another major factor that makes this Mini Quad so awesome for dirt trails. They go over any bumps and minimize the impact they would have. In addition to this, there are also brakes at the rear and front. These are reliable and work effectively to bring your child to a safe stop. There are 2 speeds available. 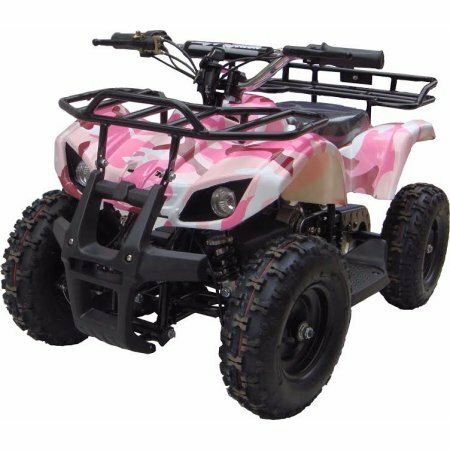 The low-speed setting will limit the speed to 5 mph, whereas the high-speed mode will let your child take the quad to its top speed of 10 mph. This feature gives parents plenty of assurance that their child can ride around at safe speeds. The twist throttle mechanism is easy to use, and your child will get to grips with being able to control it in no time. 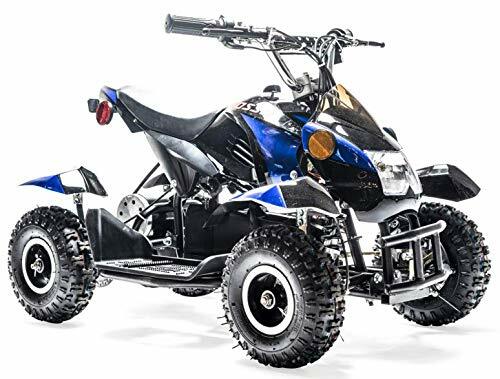 With such large pneumatic tires and a full suspension system, kids have been having a great time riding this Mini Quad around on off-road terrain. The ZCTDR 4-wheeler is powered by a 24V battery. This provides your child with an impressive amount of speed to play around with. You can reach a maximum speed of 15 mph while riding this one! We were also impressed with how they’ve constructed the frame using steel materials. It makes the ATV incredibly strong and durable. It’s able to effectively resist damage from riding on rougher surfaces. As a result, you can expect it to last your child for years ahead. There are mechanical disc brakes at the front and rear of the 4-wheeler too. We found these to be reliable at bringing your child to a safe stop, no matter how fast they’re going and what kind of surface they’re on. There’s a lot of legroom available with this one too. Therefore, kids are given the chance to grow into it and be able to ride it around as they grow older. It can also support a maximum weight capacity of 180 lbs. Due to the durable steel frame and how there’s plenty of legroom, your child will be able to have fun riding this for years. It’s incredibly durable and fast enough for kids who are growing up. If you’re after something that has a vintage look to it, this 24V Scooter from Razor could be just what you’ve been searching for. 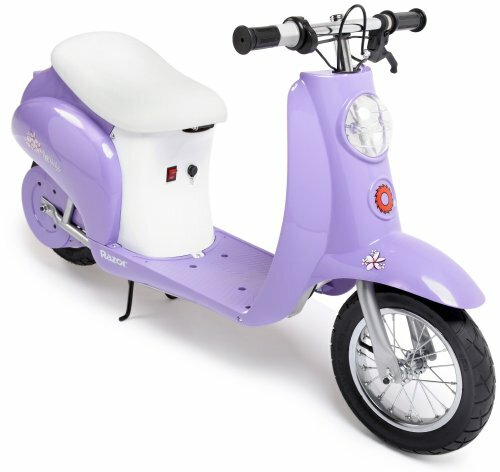 It has been designed to look like a vintage scooter which gives it a fantastic visual appeal and it currently comes in 7 different awesome colors, with options that are well suited for both boys and girls. There is a chain driven electric motor that allows kids to travel at a maximum speed of up to 15 mph. This is plenty of speed to allow your little one to have a blast while also remaining safe. We were impressed with how they’ve fitted 12″ pneumatic tires and a rear suspension system. These both work effectively to provide the scooter with a lot of stability while going across bumpier surfaces. The vintage design makes this scooter look fantastic and kids have fun riding it due to its high speeds and smooth riding features. The MX400 Dirt Bike is able to travel at an impressive top speed of 14 mph with a total of twenty four volts of power. This is an excellent top speed for children as it allows them to have a lot of fun while also being safe. They have fitted 12″ pneumatic tires which work effectively to let kids ride across dirt and tricky surfaces without any issues. The bike is still able to travel fast and provide your little one with all the control they need. Parents have also been liking how the chain driven motor that has been fitted operates quietly. While it’s quieter, it still has a lot of power to offer at the same time! 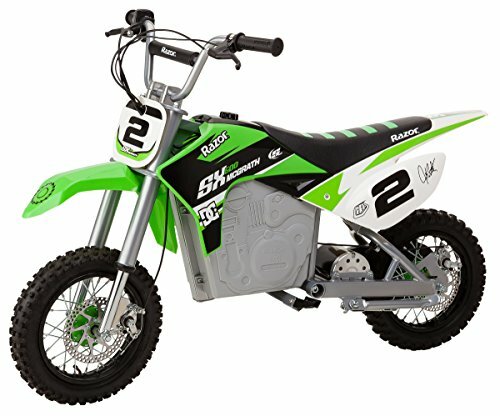 The 12″ pneumatic tires allow kids to take this bike to its maximum speed while on rougher surfaces and still have complete control. 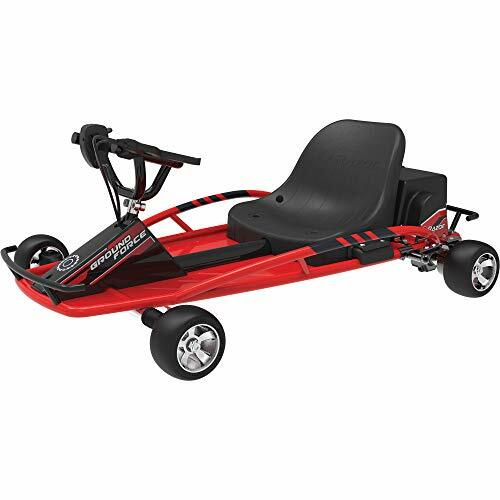 We were impressed with how you can charge this Go Kart Drifter and let kids drive it around for up to 45 minutes continuously which is longer than most 24 volt vehicles. This provides your child with lots of time to play outdoors before this one needs recharging. It has a maximum speed of 12 mph which is perfect for the age range that it has been recommended for. This ensures that your little one is able to ride around and have a blast without being put in danger. There’s a variable speed feature available which kids have been liking. It means that they can alter their speed and not have to go straight to the top speed all of the time. High-quality wheels have also been fitted that provide the go kart with a lot of stability. Kids have been having a blast riding around on this Go Kart and going up to 12 mph while enjoying a smooth riding experience due to the wheels that have been fitted. 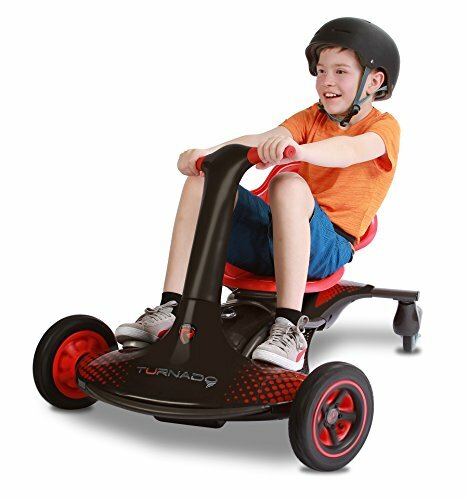 With pneumatic wheels installed the 24v Turnado 1 Seater provides your little one with plenty of traction and control while riding across rougher patches of road. A seat belt is also available which keeps your child safe at all times. After being fully charged, this ride on toy can last for 30 minutes of continuous play, which is more than enough to allow kids to have a blast outdoors. It can also travel at a maximum speed of 12 mph. This top speed is awesome because it still lets children enjoy themselves, without putting themselves at a high risk of any accidents. We also liked how the torque steering that’s available makes it easier for children to operate the toy. This is a great ride on toy that lets kids have easy control over the steering while traveling at 12 mph with a lot of smoothness. 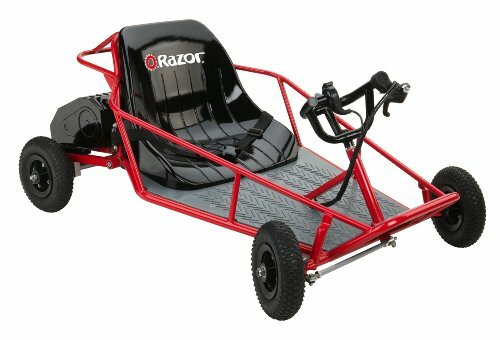 This Razor Dune Buggy is powered by a 350 Watt (24 volt) electric motor that enables children to travel at a top speed of 10 mph. Kids have a lot of fun being able to travel at the speed while also ensuring that they can prevent any accidents. There are 8″ pneumatic tires available too. These are effective at providing your child with a smooth ride, no matter how rough the surface is. We also liked how there is a bucket seat that has been padded to keep your child comfortable. In addition to this, kids can easily control the toy by using the hand throttle to accelerate and the brake to slow down. With tubular steel materials used to construct the frame, this ride on toy is incredibly durable as well. With the pneumatic tires and 10 mph top speed, your little one is able to have a lot of fun outdoors, while also being safe. 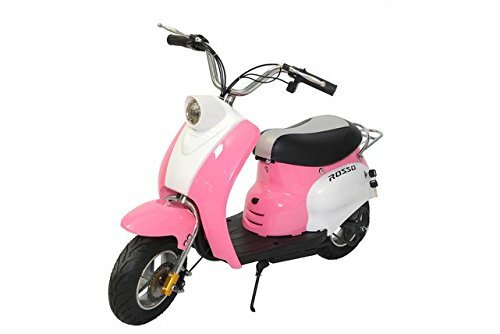 This Rosso Motors Pink Moped is powered by a 24 volt battery and girls especially love the pink color. This provides them with plenty of power to have fun with. This moped toy has been modeled after the Vespa Scooters which provides kids with a greater sense of reality. It can be used as a prop during any roleplay games too! We were impressed with how they’ve fitted the scooter with tires that are made out of rubber. This ensures that your child can ride the moped with a lot of stability and support. It’s also a large factor in how much control kids have over the scooter for a safe riding experience. Girls between the ages of 7 and 14 have been loving the pink design and how it looks like the classic Vespa Scooters. The rubber tires provide kids with a lot of support and control for a fun and safe time. 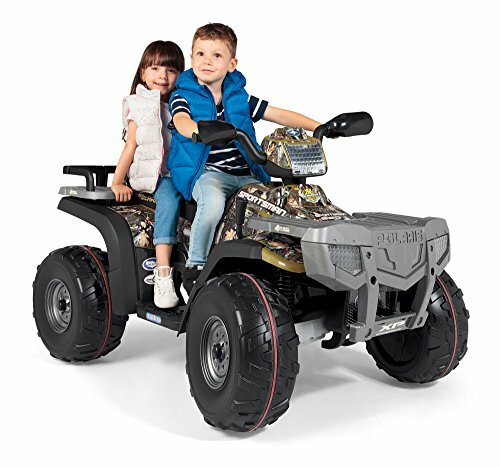 This 36 Volt ATV has a 500W motor that provides your little one with plenty of power to have fun outdoors. We liked how there’s a 3-speed system and reverse function available too. They have fitted fantastic tires to this one that have been specifically made to deal with all kinds of terrain. Since they have been made out of rubber materials, you can be sure that they can handle bumpy surfaces. Not to mention, a high-quality shock absorbent system is included too. This provides your little one with even more smoothness while riding. A reliable disc brake system is also available to help your child bring themselves to a stop every time. With reliable disc brakes, 3 speed settings, shock absorbent system, and high-grade tires, your child can have a blast outdoors to ride across rough terrain and have a blast! 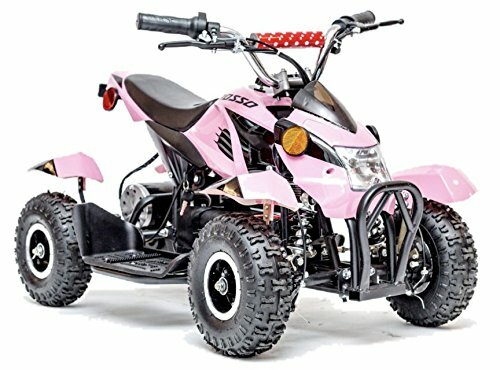 This Rosso Motors 36V Pink ATV is an excellent option for girls. We liked how it comes with rubber tires that have been specifically made to deal with all kinds of terrain. An awesome shock absorbent system has also been fitted. So, you can expect your little one to ride around outdoors and go across tricky surfaces while being provided with plenty of support to enjoy it smoothly. A disc brake system has been implemented too. This works effectively to bring your child to a safe stop every time. They can also alter their speed by choosing between the 3 speed settings available. Girls have been having a lot of fun riding this one outdoors and being able to challenge themselves on rougher surfaces while having total control. The McGrath SX500 is able to travel at a top speed of 15 mph, which is plenty to allow kids to have a blast outdoors for years to come. They have used an awesome design to make this one as well. As a result, kids have found it incredibly exciting to ride. We liked how there is a high-torque available as it lets kids have precise controls over the steering. There are also variable speeds available too. So, you can select the speed setting that you think is best for your little one. Furthermore, there are pneumatic tires available that provide children with a smooth riding experience. Hand operated dual disc brakes are also included which are easy for kids to use. If your child is a fan of motocross, they’d have a blast riding this one because of how it has been designed. They’re also able to ride safely due to the easy-to-operate dual disc brakes. 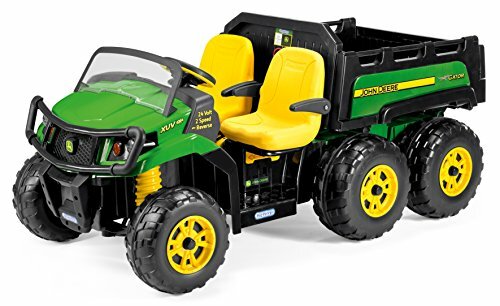 Now that you know more about what some of the best battery powered ride on toys are, you may need a little more guidance on how to pick out the one that suits your child best. When it comes to finding the best ride on toy for your child, there are some factors to consider beforehand. Being sure to pick the right one will ensure that your child is happy and can have a lot of fun playing with their toy. Let’s take a look at what some of the factors to consider are below. Your child’s age will have a lot to do with the kind of ride on toy that you choose for them. This can be confusing, but we’ve made it easier for you in the review above by providing you with a recommended age range for each item. Choosing a ride on toy that has too much speed can be dangerous for your child. Having said that, most of the ride on toys available now have parental control settings. You can put a limit on the top speed to ensure it’s safe for your child. Some of the options in our review also come with remotes that let you have complete control over the toy. On the surface, playing with these rides on toys just seems like a fun activity. While that is true, your child is also able to develop their motor skills and hand-eye coordination at the same time. Driving around require a throttle or pedal which kids use to learn how to control their speed. The steering wheel or handlebar is what they use to turn the toy in whatever direction they like. This is effective at improving their coordination and motor skills. Moreover, it’s an excellent way to develop their spatial awareness abilities. In this review, we have included both 24 and 36 volt powered ride on toys to provide you with some variety. The 24 volt options are best for children who are beginners to these kinds of toys while the 36 volt option is better for your children as they gain experience and get a little bit older. Once your son or daughter reaches their teen years it may be time to look at electric scooters or even 48 volt ride on toys. This is because they have less power and a slower maximum speed. If you’re looking for something for an older child, or one who has more experience with ride on toys, the 36 volt ones would be best. They have more powerful batteries which allows kids to ride them at faster top speeds. Be sure to look at the age recommendations for each of the options in this review to gain a better understanding of which ride on toys are the more suitable for the varying age ranges. There are tons of different types of battery operated ride on toys available. Understandably, it can feel overwhelming differentiating between the various kinds that are on the market. To help make distinguishing between these ride on toys easier, have a quick look below. Battery powered ride on cars are a popular choice among kids. The steering wheel and seat with seat belt features make them best for children who are a little younger. The design of these cars tends to be realistic and it encourages kids to imitate how their parents drive. This is a creative process that strengthens their cognitive abilities. Electric trucks are a blast for kids because they have larger designs that allows for more space. There are also models that feature 2 seats which means your child can have fun driving around with a sibling or friend in the passenger seat. Ride on dirt bikes and motorbikes are a lot of fun for kids. Many of the models available have been inspired by real bikes, which means their designs are often very sleek. Kids also enjoy using the throttle and handlebar to control the speed and direction of the bike. Ride on Jeeps are fantastic when it comes to off-roading. This is because their structures tend to be bigger and more solid. Therefore, they’re able to withstand the rougher nature of off-road surfaces. The wheels are larger and can provide your child with more support too. Ride on tractors are incredibly popular among kids as they love to drive them around the garden and pretend they’re cutting the grass. Similarly, to the cars, ride on tractors help to inspire your child’s imaginative side as they copy what they’ve seen their parents do in the backyard. Ride on police cars is another fantastic choice for kids who love to play imaginatively. They can drive the ride on police car and pretend to be an officer on patrol. It also leaves more options open for playing games. For example, you could be a robber and they could be the cops who chase you down in the vehicle! 4×4 vehicles are fun for taking on off-road trails. This is because it allows them to explore new areas they otherwise can’t while the 4-wheel drive give them with more precise control on rough road conditions. 4-wheelers, such as ATV’s and quads are a lot of fun and are essentially a more advanced version of 4×4 vehicles discussed above. They tend to be great options if you want your child to have a toy that they can play with both indoors and outdoors. Their design makes them suitable for taking on more bumpy off-road surfaces. However, they’re also still great for driving around in large indoor spaces too. Motorized Scooters are incredibly popular among children these days and can be some of the fastest. They are a lot of fun while also being cheaper than other 24 and 36 volt ride on toy options. It is especially important that you parents make sure your little has the right safety gear since Scooters are much easier to fall off of than some of the other ride on toys listed in this guide. There are many different brands of battery powered ride on toys. Let’s take a look at what some of the top ones are below. 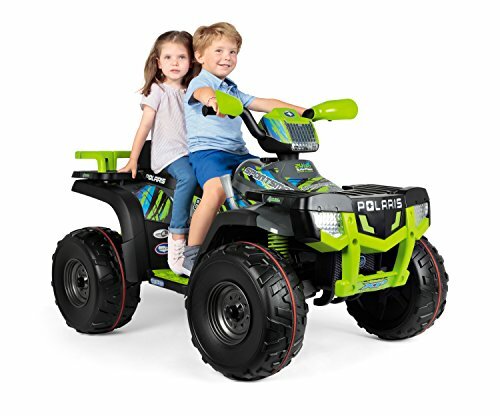 Power Wheels is an incredibly popular and well know brand that has been creating high-quality ride on toys for kids for years. It is without a doubt the most iconic name among electric ride on vehicles for kids and it is quite common for people to refer to all powered ride on toys as ‘Power Wheels’. Peg Perego is an awesome brand that has created all kinds of products for kids. These range from car seats and strollers, to high chairs and, of course, tide on toys. They’ve gained a fantastic reputation for manufacturing high-quality kid’s items, especially when it comes to ride on toys. They’re always easy to assemble and durable to ensure they last your child for years of play. The Polaris models are among the most popular within the Peg Perego brand. So, those were some of the best battery powered ride on toys for your little boy or girl that are available online, right now. Use our review to gain all the information you need to know about the main details, pros, cons, recommended age ranges, as well as what makes each ride on toy stand out. If you were still feeling confused as to which one would be best for your child, the buyer guide section just above provides you with more information to make the buying process as easy as possible. Hopefully, you’re now armed with everything you need to go and buy a ride on toy that your child will have fun playing with for hours on end! The XtremepowerUS Mini ATV has been fitted with some fantastic disc brakes. They work effectively to bring your child to a safe stop, even when traveling at the top speeds that it has to offer. This quad ride on toy can reach a maximum speed of up to 12 mph. Therefore, there’s a lot of speed on offer for kids to have a lot of fun with. Parents can also fully adjust the speed limit to ensure that it is suitable for their child’s experience level and abilities.s. We were impressed with how the frame has been constructed using incredibly strong steel materials. 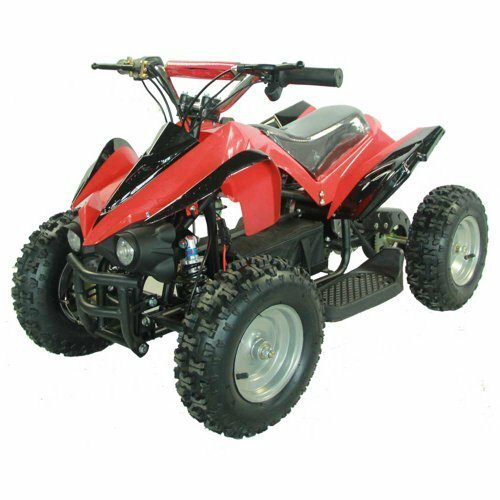 This makes the ATV more durable and able to withstand damage to last longer. It takes around 6-8 hours to fully charge. Once at its full charge, you can use it for around 2 hours before it needs recharging again. The 12 mph top speed is faster than most of the other ride on toys in our review. So, your child is bound to have a lot of fun with it! You can also set the speed limit to something that’s best for your child’s experience level. This Sports Quad has been created with 2 drive motors. 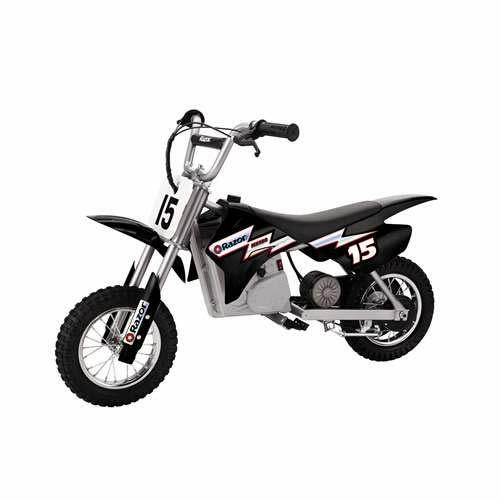 This provides your child with a lot of power to ride around and have fun with. We were also impressed with the design of this one. It looks sleek and realistic which kids have been loving. In addition to this, the quad is larger and stronger than most ride on quad toys. As a result, it’s able to withstand more damage and last your child for a longer duration of time. The 4 wheels add to the riding experience even more. This is because they have been made using rubber materials. They work effectively to provide your child with a smooth ride while keeping them supported at the same time. A music system is available too. They’ve implemented a built-in speaker which you can use to plug is USB and MP3 devices to listen to music as you ride around. Moreover, there are also LED headlights which are awesome for lighting up the way during darker conditions for safe riding. With a music system available, kids will have a lot of fun listening to their favorite music and riding around. The LED headlight feature is also excellent for ensuring they can see clearly when riding in darker environments. MotoTec’s 4 Wheeler is able to reach an impressive top speed of up to 10 mph. This provides your child with plenty of speed to drive around and have a blast with. At the same time, the company has ensured to make sure the car is safe for kids. As a result, they’ve included a parental speed control feature. This is controlled by a key and it can’t be altered without it. Therefore, if your child is inexperienced with driving, you can put a limit on the top speed they can drive at until they’ve gained more experience. This car toy can handle a maximum weight capacity of up to 150 lbs, which is plenty for the recommended age range of 24 months – 10 years. We also liked how kids can play with this ride on toy both indoors and outdoors. It gives them more freedom to be outdoors to get some fresh air. However, if the weather’s bad, they can still have fun with it indoors. With a top speed of 10 mph, kids will have tons of fun driving this ride on car toy around. However, parents are given a peace of mind by being able to put a cap on the speed limit. 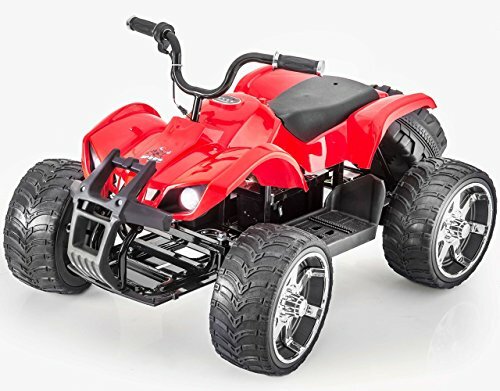 The Rosso Motors Quad has a 36V battery and 800 watts to power it, you can be sure that your child is provided with a lot of power to have an absolute blast outdoors with. There’s a 3-speed setting that lets kids choose the most appropriate one for themselves. We also liked how the all-terrain rubber tires that have been fitted are of a high-quality. Not to mention, a fantastic shock absorbent suspension system has been included as well. These are great for giving your kids a smooth ride across rough surfaces. Furthermore, a disc brake system has been implemented. This works effectively to bring your little one to a safe stop every time, which provides you with a peace of mind. Children have a blast on this ride on toy due to how they’re able to take it on rougher surfaces and ride smoothly. 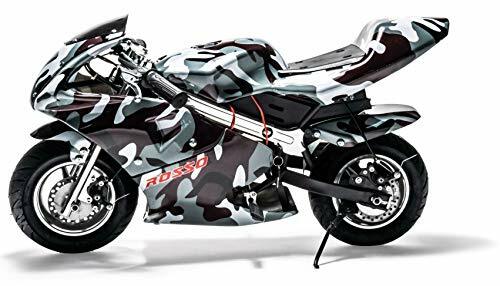 With a 3-speed feature available this Rosso Motors Pocket Bike, you can be sure to select the speed that’s most appropriate for your child and their experience level. These speeds can range from 6-16 mph, which is plenty for kids to have fun while being safe. We liked how they have fitted pneumatic tires to this Pocket Bike Ride On toy as it allows kids to ride across trickier surfaces and still have a lot of control and stability. A disc brake system is included too. This system is easy for children to use and ensures that they can bring themselves to a safe stop reliably every time. Kids have also been loving the motorcycle design that they’ve used with this one. This is a great option for kids who want to experience what it’s like to ride a motorcycle. The pneumatic tires allow them to experience a smooth riding experience too.